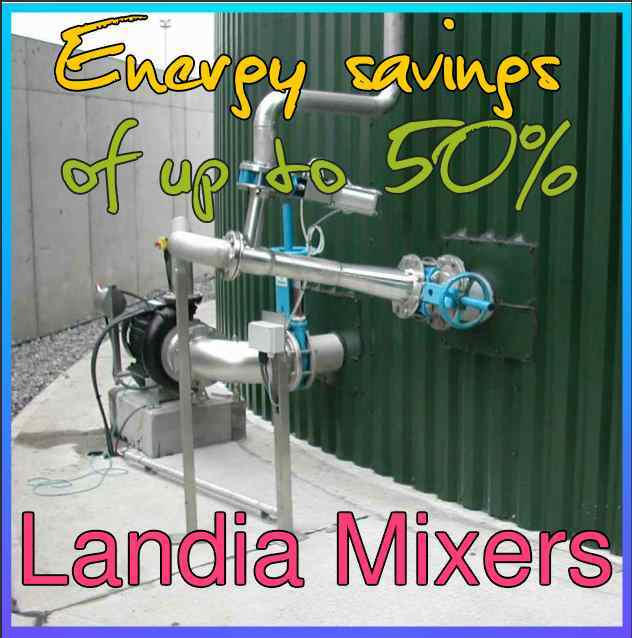 Landia is the company that quietly upped the game for the efficiency of biogas reactor mixing in 2016. Landia has demonstrated how those fortunate plant operators that have adopted the Landia GasMix system are quietly pocketing the income for the AD plant operations, and will continue to do so for the lives of their plants. 2016 was a year for many technological advances in anaerobic digestion, and in this blog we have spoken of the awesome increases in biomethane production in the UK. However, of equal importance, but receiving far less publicity is the progress being made in the UK AD industry reducing sacrificed anaerobic digestion bioreactor loads and energy, which otherwise could be sold. Every single kilowatt hour (Kw hr) expended on sacrificial energy loads running any AD plant, can be pure income toward the AD company’s bottom line. Now that there are about a hundred more AD plants operating in the UK than there were 1 year ago, equipment manufacturers have an added incentive to devise and market AD plant energy saving technologies, and one company who has now been doing that for over 5 years is Landia Technology, with their . AD Operators and water companies can reduce the energy usage of their digester pumps and mixers by up to 50%, according to leading manufacturer, Landia. “It is somewhat ironic that in an industry trying to create and save energy that there is so much energy being wasted”, said Landia’s Paul Davies. “Poorly designed mixing systems located inside a digester, which are difficult to service, are typically using 7.5kW motors running flat out 24/7, using up 180 kW hours per day. “Motors on externally-mounted systems that are also far easier to maintain, may be bigger at 18.5 kW, but only have to run for 10-15 minutes per hour to achieve the same or often better results. Even at 15 minutes per hour, the energy usage is just 110 kW hours per day, compared to 180 kW. This is on just one mixer/pump, so the energy savings are substantial”. “It was a very timely and encouraging conference session put together by ADBA (Anaerobic Digestion & Bioresources Association),” said Ian Goddard. “Landia’s GasMix (Twice Highly Commended at UK AD & Biogas Industry Awards), which is easy to retrofit, is at the forefront of improving gas yields – a system we don’t make but have in our Renewables portfolio because we believe in it so much”. He added: “It is therefore heartening to think that the water companies can be less risk adverse – embracing such a low maintenance yet highly effective technology that allows them to greatly improve revenue”. At its very first attempt, Landia gained two Highly Commended Honours at the much-coveted UK AD & Biogas Industry Awards. In recognition of the success of its GasMix digester mixing equipment at the acclaimed Richgro AD plant near Perth, Landia was applauded by the independent panel of judges for the considerable part it has played in the first renewable energy site of its kind in the whole of Australia. The externally-mounted GasMix system was chosen by Richgro for its enhanced gas yields, ease of service and reduction in volatile solids. For pre-treatment, GasMix also reduces viscosity by 30% (as tested by the University of Aarhus in Denmark) and is energy-efficient, usually only needing to run for 7-10 minutes in the hour, so the consumed power is just one-sixth of the installed power. In addition, Landia’s GasMix digester mixing system was also Highly Commended for its reliability and supreme performance at Eco Sustainable Solutions’ food waste-to-energy AD plant in Dorset, where it has increased gas yields by a massive 12.5%. A total of four Landia GasMix systems serve two 2500m3 digesters, utilising 18.5kW chopper pumps to generate a total of 700m3 gas per hour. Total mixing is achieved via specially angled recirculation nozzles. Compared to many energy-burning systems that have to run flat-out, 24/7, Landia’s GasMix at Piddlehinton only needs to operate for approximately 10 minutes per hour. Despite using 18.5kW motors, compared to typical 7.5kW submersible units, GasMix has been shown to use fifty per cent less energy than the previous system. Editor at wateronline.com, Kevin Westerling attended the recent 89th Annual Water Environment Federation Technical Exhibition and Conference (WEFTEC), the world’s largest annual water quality exhibition. 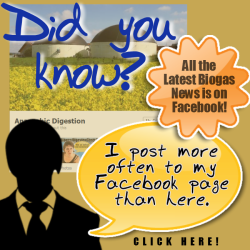 Also available from this website is the Biogas Yield eBook here, which includes many more ways to increase biogas yield. Wow, your website is magnificent, let alone the content material! For a well designed mixing system the distribution of power used in the mixing is very important. Excess power concentration in parts of the vessel can have a damaging effect, due to excess shear and elongation in high energy parts of the AD Plant system. Mixing efficiency is hard to measure from power consumption. This is due to the three basic power loss centres being a) in the motor, b) the gearbox, c) the tank in which the mixing occurs. Each of these needs quantifying in order to get a reasonable prediction. Unfortunately, most mixing system buyers fail to verify their energy usage, so there isn’t much information out there to compare efficiencies.